On an artificial seabed 10 metres underwater offshore from the Xisha (Paracel) Islands, a couple of staghorn corals some 20 centimetres in diameter branch up in the shape of a deer’s horns, displaying their dazzling colours. Small fish dart back and forth between the branches. According to Zhang Yuyang, who transplanted the coral from a much larger growing cluster nearby, they have grown from the size of a human finger in just a year. Zhang is a scientist with a coral reef biology research team from the South China Sea Institute of Oceanology, at the Chinese Academy of Sciences. 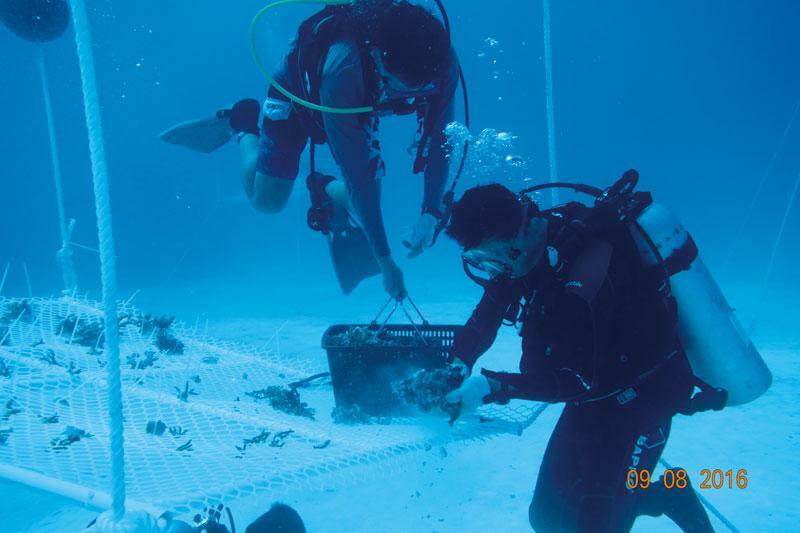 The team’s major role is planting and cultivating coral on the floor of the South China Sea. Many of the team have been working in the field for almost 10 years. The team leader, Professor Huang Hui, has worked on coral reef conservation in the region for more than two decades. The distribution and healthy growth of coral and reefs is a significant indicator of healthy ocean ecology. Only pristine ocean environments allow the special interaction between coral polyps and planktons that produce a coral reef. Coral reefs are the habitat for a wide range of marine life. A good analogy goes like this: the significance of a coral reef to ocean ecology is comparable to the significance of forests to mountain ecology. The function of forests is obvious; to prevent erosion and stabilise soil and preserve wildlife – without forests, mountains are bare land. Coral reefs are described as the rainforest of the sea. They can effectively prevent beach erosion by waves, as well as offering a breeding ground for marine life. Of the total global seabed of some 360 million square kilometres, coral reefs cover just 0.2 percent. Despite that, they provide shelter for a quarter of the ecology of the ocean. They are hosts to a huge number of associated fauna, and the loss of any particular type coral could bring about the demise of an entire species. Economic activities including fishing, oil and gas extraction, tourism and more are all closely enmeshed in the existence of coral reefs. Research revealed in an article titled “The Wicked Problem of China’s Disappearing Coral Reefs,” authored by Huang Hui and scientists from James Cook University in Australia, that “coral abundance has declined by at least 80 percent over the past 30 years on coastal fringing reefs along the Chinese mainland and adjoining Hainan Island.” The coral reefs of the South China Sea region are thought to be the eighth-biggest in the world, 2.57 percent of the global total. Professor Huang Hui clearly remembers the first time she went to Yongxing Island in the Xisha Islands to conduct reef-related fisheries research back in 2002. “The Xisha Islands area was a real paradise back then,” Professor Huang told ChinaReport, adding that it was easy to see the seabed clearly from the boat and the most densely distributed coral area covered more than 90 percent of the area. She described the view of dancing coral in rich colours, swarms of fish in between outcrops of coral and turtles ambling along the seabed. Fishermen could harvest an average of five metric tons of sea cucumber per day. Climate change can lead to a rise in ocean temperature that causes coral to die. An El Niño event in 1997-1998 caused approximately 16 percent of the world’s coral reefs to bleach. Some areas suffered 10 months of rising temperatures. And in the Maldives, between March and May 2016, around 73 percent of coral reefs suffered bleaching. In 2017, marine biologist Julia Baum of Canada’s University of Victoria said that even if the world was able to halt climate change today, scientists still expected more than 90 percent of the world’s coral would die by 2050. Without drastic intervention, she warned, we risk losing all of it. Wang Xiaoqiang from the State Oceanic Administration said biodiversity and the environment in the South China Sea region have suffered serious destruction and degradation. This was the context in which the global community started to conduct coral reef preservation and restoration projects. Huang and her team launched China’s first project of this kind in 2005. She admitted China was late to the initiative compared to countries like Japan and Israel. “We lagged behind international state-of-the-art techniques and experience by at least 20 years,” she said. 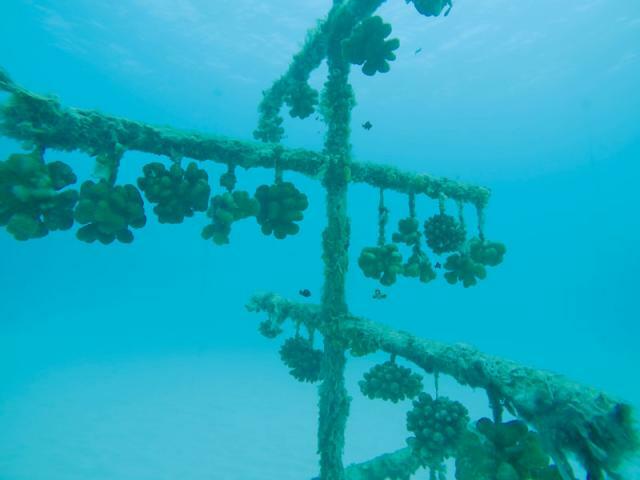 “The nursery is only one small part of the process for reviving depleted coral species,” Zhang Yuyang told ChinaReport. The whole process includes egg harvesting, proliferation, nursery, transplanting and more. Zhang says the nursery is the final step before adult coral can be transplanted to the reef. This nursery project currently underway began in 2015 and is slated for Zhaoshu Island Reef. Yang told our reporter that in the coming years, new nursery coral will need to be added on a daily basis to sustain the project. Zhang Yuyang joined Huang Hui’s team in 2008 after he graduated from James Cook University. His major responsibility was to conduct coral breeding tests. After a whole year of preparation and observation, he successfully collected coral eggs from the sea adjacent to Sanya, Hainan Province for the first time in April 2009. Due to the seasonal nature of the coral breeding, scientists like Zhang need to monitor changes to coral seeding closely. They must dive every half hour for almost a whole week before ovulation time finally arrives. Scientists are trained to distinguish and collect fertilised eggs and seal them into containers with a fixed temperature of 26 degrees Celsius back on the boat. A lot can go wrong. On a dark night in 2012, Yang Jianhui, an assistant researcher on the team and his colleague encountered an unexpected undercurrent when he was in the water collecting eggs. They were swept away from the boat and lost their bearings. Ultimately the pair was able to dive deep into the water to swim against the current, finding the boat based on their memory of its position. Other uncertainties and difficulties that plague the breeding process are sudden power blackouts – which have a devastating impact on young corals in the laboratory. In 2014, such an incident killed all of the fertilised coral eggs collected at a laboratory in Sanya. In 2011, Huang’s team published an article on sexual reproduction and the development process of reef coral in Chinese, the first of its kind in domestic research circles. The team has now mastered the coral’s breeding cycle in various spots with a deviation of less than three days. In 2010, Huang Hui’s team was given a national science pilot project to restore one hectare of coral reef near Yongxing Island. Sadly, the restoration was ultimately unsuccessful, so since 2013, the team started to explore new ways to nurse coral according to different natural conditions. In another location, the team adapted the seabed nursery measure first. They used hard plastic nets to cover the dead bodies of coral on the seabed, and then attached collected coral fragments to small concrete disks. By the summer of 2017, the number of corals in the test area had recovered by two or three times that of the nearby region, increasing from 2.5 to 19.3 per square metre. In 2015, Huang’s team started a new project in an area with strong ocean currents. When the seabed fixing measure fails, they adopt a “tree” nursery pattern pioneered by The Nature Conservancy’s coral growth project. A treelike structure composed of PVC plastic branches is planted into the seabed and staghorn coral is fixed to each branch. Growing coral is not an easy task, and scientists face many challenges on the ocean. Despite this, the most headaches, according to Huang, are caused by unexpected weather. “The daily rental for a boat is 20,000 to 30,000 yuan (US$3,130 to 4,695), so when a sudden storm occurs we have to wait, and it costs a lot,” Huang told the reporter. The project of to restore coral in the South China Sea has lasted more than a decade. But in Huang’s view, this is just the beginning of the recovery of the coral system. “We need another 10 years before we will see real effects,” said 49-year-old Huang. Compared to 10 years ago, the coral restoration has caught the attention of more and more young people who enjoy working in marine conservation. For the near future, Huang plans to train local fishermen to perform professional coral restoration themselves.